In 4th quarter of 2018 we began to develop the new version of our heartpiece iBWIM Spider. Beside the possibility to manage up to 14 sensors (8x voltage, 2x current, 1x PT1000 and up to 3 digital outputs) there are different operating modes. 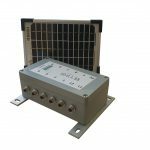 Amongst others the Spider 5 can be used as an independent, battery powered data logger, the possibility to use photovoltaic panels is integrated which clearly extends the applications. Data recording is done with latest 32 bit technology and a sampling rate up to 3000 Hz which enables a possible accuracy of lower one micro strain [µS].